Madam Speaker, as I present this Statement on The Restoration of Electricity in the Territory, I must begin by highly commending the team at the British Virgin Islands Electricity Corporation BVIEC, for their efforts so far, which is nothing short of heroic. Our ability to generate power across the islands was rendered incapacitated by Hurricane Irma on September 6th, as all of our power plants suffered minor or major damage and this seriously impacted our electrical infrastructure. Approximately 12,000 poles, 400 miles of conductor cable, 2,200 pole mounted transformers and 3,500 streetlights, were damaged. While the substations on Virgin Gorda and those in Long Swamp and Pockwood Pond on Tortola remained intact, with only minor damage, the Long Bush substation was compromised. Thankfully, Madam Speaker, it remained operable. Station A of the Henry Wilfred Smith Power Plant at Pockwood Pond was even more so compromised, as the roof was damaged and rain water affected the engines. Station B, the new power station which was completed at Pockwood Pond in May 2017, remained intact, with minor damage. Madam Speaker, due to the minimal damage to the roof of Station B, this extension was energized via the black start unit, shortly following the storms. Station A, however, took some time to be energized, as large sections of the roof had to be repaired and the high and low voltage systems thoroughly assessed, prior to energizing the plant. In addition to the high and low voltage systems, the auxiliary panels for the generators also had to be thoroughly assessed, prior to attempting to start any of the generating equipment in Station A. A technician was brought in from Imtech Vonk and from October 11th – 30th, in collaboration with our resident electricians, they were able to assess and repair the auxiliary panels for Wartsila engines 5 – 8. Wartsila engines 10 and 11 are currently providing power to the Territory, while Units 7, 8 and 12 are on standby. Madam Speaker, the Corporation’s offices at Long Bush, including its IT systems, were severely damaged. The Administration Building has now been cleaned and the cash collection function re-established. The Corporation has also since set up and is operating from temporary offices at Tortola Pier Park. Madam Speaker, as we look around and see more and more communities lighting up, just two months after being plunged into darkness by the hurricanes, I think we can all say how very proud we are of the team at the BVI Electricity Corporation. BVIEC sped into action as soon as it was safe to begin the restoration process. The first priority was to get power to Peebles Hospital, which they did within a week. The central areas of the capital Road Town were restored shortly thereafter. 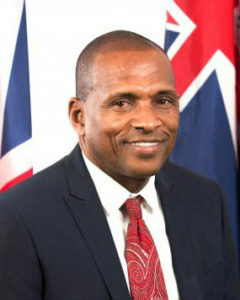 Madam Speaker, the Corporation made the wise decision several years ago to place the Wickham’s Cay Distribution Feeders underground and as a result, these feeders were not affected by the storms. While the restoration process was halted for a few days after Hurricane Irma, as Hurricane Maria passed southwest of the Territory, within a month’s time, 30% of the grid was restored. On behalf of the Government of the Virgin Islands, I express gratitude to Carilec, the regional electricity umbrella organization, which sent teams of linesmen from other Caribbean countries to boost local efforts. At the peak, there were teams of up to 75 linesmen on the ground, from Aruba, Belize, Bermuda, the Cayman Islands, Grenada, St. Lucia and St. Vincent and the Grenadines. Madam Speaker, the Government of the Virgin Islands is also grateful to the United Kingdom Foreign and Commonwealth Office (FCO), who worked with BVIEC to hire a private firm, Valard Construction LP, to provide 27 linesmen and support equipment. This contractor has been assigned to the Long Bush West End and the Long Swamp College feeders. They are required to complete the entire restoration of these feeders, from laying poles and connecting customers, within an eight-week period. In addition, Madam Speaker, the BVI Electricity Corporation is negotiating for additional linesmen, as we work towards expediting and completing the electricity restoration process ahead of the timeframe originally anticipated. Madam Speaker, prior to Hurricane Irma, peak demand for electricity in the Territory was 34 megawatts. Post Hurricane Irma, we are back up to 13.2 megawatts of generating power, with another several engines available to provide an additional 19 megawatts, once the distribution system is ready to connect customers. Again, Madam Speaker, the damage to our National Electricity Grid as a result of these hurricanes, was unprecedented. However, swift progress is being made to restore power to every area of our islands and we are happy that this is being done in a timely and safe manner. Madam Speaker, I am very pleased to report to this Honourable House, that to date, approximately 40% of the infrastructure has been restored on Tortola, 50% on Virgin Gorda and 90% on Anegada. This is a significant achievement and I recognize the BVIEC and all those who lent their assistance, for a job well done so far. I encourage everyone to continue to work safely and expeditiously. Madam Speaker, the public has been extremely understanding in all of this and I thank everyone for their patience. We thank those residents who have gone out of their way to show kindness and appreciation to the visiting workers. Truly BVI pride #BVIStrong.